How do webcams get hacked? - Ask Leo! I’ve heard that computers that have webcams installed can get hacked. My question is how do hackers get access? Shouldn’t I be able to see the webcam software running on my screen? How can I tell if the webcam has been hacked and how do I avoid it? A webcam hack is nothing special. It’s just plain-old malware. Some malware acts as spam-sending zombies. Other malware actually performs data destruction. Still other malware might sniff your keystrokes. This malware turns on your webcam and does something with what it sees. Let’s look at how this works and what you can do. Malware does everything it can to hide itself. Think of those keystroke loggers, spam-sending botnets, or any of those other forms of malware that are typically not visible, and particularly not visible on the screen. Perhaps when you use your webcam normally you see software running ont the screen, but all bets are off if malware is involved. You may never see the webcam software running because the webcam’s being run by malware. 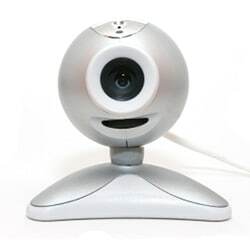 On most webcams, you should see a light on or near the camera when it’s turned on. It’s normally implemented in hardware: when the camera goes on, the light should go on, too. However that approach is not a requirement. The light might, in fact, be under the control of software. The webcam driver may have code that says if the camera is on, show the light. If that’s the case, it’s possible that malware won’t be so polite. If the two functions can be separated, the malware could turn on the camera without turning on the light. As trite as is sounds the bottom line to all this is to just avoid malware. Do all of the things that you know will keep your machine safe and malware-free. Do this and a webcam-hacking malware shouldn’t be an issue. Should I cover my webcam when not in use? - Sure, you can cover your webcam with tape. But that won't solve the real problem... you've got malware on your computer! Could a Hacked Computer Record My Skype Video Calls? - Are you curious what might happen if a hacker was in control of your computer? The question really is "What can't they do?" Should I Cover Up My Webcam When I’m Not Using It? - There's nothing wrong with covering your camera, but it's probably not worth the effort. I got two identical spam messages from two friends. Which of us has been hacked? - It's unlikely that you've been hacked. It's possible that your friends have both been hacked, but this kind of thing can happen without anyone being hacked at all! « Previous post: How Do I Tell If My Email has Been Hacked? It’s usually done with what is called a Remote Access Tool or RAT. Like many (or most) technologies, they have a legitimate use but shady people will use them for nefarious purposes. Type “ratting computers” into YouTube to see what I mean. However – some low-tech solutions…. If it’s a separate webcam, simply unplug it when you don’t want to use it. If it’s built into the monitor (like almost all laptops these days) cover it with something. This may or may not work with the microphone as well – if they are hacking into the vision, they may well be getting the sound too. I have a logitech that has a slider cover for the camera so although I also keep my anti-malware and anti-virus up to day, my low tech solution is to just keep it closed when not in use.